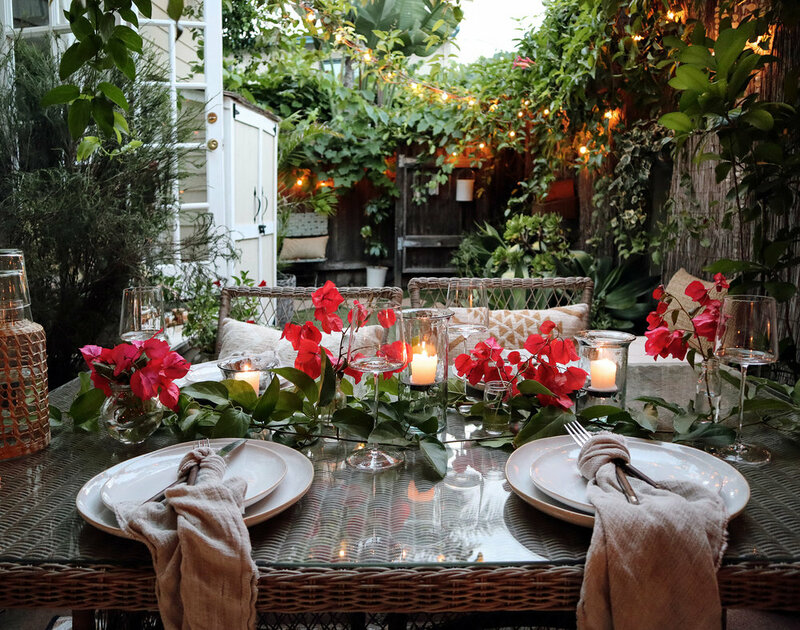 I'm over on the Garnet Hill blog today, sharing some tips for hosting summer meals in a small outdoor space. A few excerpts are below-- the full post with additional images can be viewed here. Thank you, Garnet Hill! Rather than adding sculptural pieces or elaborate vases to your tabletop, decorate with clipped greenery from your garden. Repurposed glass jars can serve as temporary water vessels for stems, and then be recycled at the end of the gathering. Use lush greenery that’s also low in profile, such as creeping vines. This will add a dynamic touch to your tablescape without consuming your limited surface space, and without obscuring your view of guests across the table. Buds in spice jars can lend pops of color without cluttering the table. With our environment in mind, consider a home water carbonator in lieu of purchasing sparkling water. In the end, it will save you time, money, space, effort, and cut back on waste. Recycled-glass drinking glasses are beautiful when paired with earth-toned stoneware plates and unfussy linens. Similarly, skip the name plates and napkin rings. Tying napkins in a knot and threading silverware through the loop is a great way to save space on your table, and cut back on an unnecessary accessory without undermining your display. When hosting, we’re frequently on our feet, running around and getting our body temperatures up a bit. It helps to remember to take a deep breath and just enjoy the experience, and to consider our own comfort as much as that of our guests. Sustainable linen is the ideal fabric to wear when hosting in the summer. It’s versatile, strong yet airy, naturally antibacterial, and grows softer with time.